Let me ask you a question. Do you run or workout? If the answer it yes, and it should be, you should consider listening to music while your active. Now not only will music help pump you up and keep you in your zone, it can also act as a timer. The trouble is of course that you have to listen to your tunes with a headphone, especially if you are running. That can present some problems. Ordinary headphones just are not designed to be used during strenuous physical activity. But have no fear. Enter the fitness headphones. One of the major differences between ordinary headphones and fitness headphones is the fitness ones, will actually stay in your ears while your running and moving about. They all have a little different design to accomplish this but it usually involves some form of over the ear clip to keep them locked in place. Most styles are the in the ear variety as opposed to the larger over the ear models. Keeping in place is a key consideration because the last thing you want to have to worry about during a good set or in the zone while running is "oh no my headphone just fell out! Now I need to stop and fuss with it so I can try and get back to being awesome." As part of being awesome and getting in shape, there usually is some sweat involved. Sweat, which is a lot of saltwater and thus very corrosive, will kill regular headphones. If you work out hard and wear regular headphones, you will be going through them at a rapid rate. Now you won't get shocked or anything but still, who wants to keep replacing headphones. They aren't free. So that's one of the got to have features of fitness headphones. They are almost always sweat and water resistant. Sometimes it could be a rain shower that soaks you and not just perspiration escaping your body. 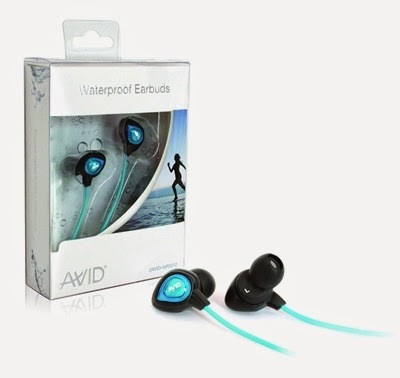 With water/sweat proof headphones, your covered. Another thing to consider is the sound. You could have indestructible headphones that would never fall out but if they sound like the inside of an old tin can, they aren't going to cut it. Luckily this is less of an issue these days as most companies realize people want something that works good and sounds good as well. A quick glance at the back of the packs will give the response range. Compare a few packs, and you'll see they are all very close. Remember the bigger the range, the better. Also important to making sure the headphones work without being a hassle is the cord. More specifically the length of the cord. If you are running or even doing most anything where you are moving about, you need a longer cord. Nobody wants to have their headphones unplug from their ipod as soon as they start to stretch out. The whole point of technology is to compliment your activity not hinder it. There also are issues with the type of cord and if you can roll it up without it tangling etc. If cords are a huge issue, they do have Bluetooth headphones that are wireless. Fitness is important. Everyone could probably use more of it. Music is also important to many people. Maybe even more important than fitness. Now if you can combine the two with fitness headphones, well that's just a beautiful thing. Want more ideas for your gym or fitness center? Visit us today at FirstClassHeadphones.com!